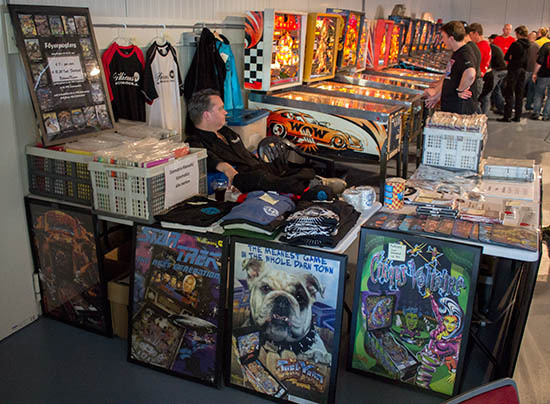 The Dutch Pinball Masters (DPM) is traditionally held at the Dutch Pinball Association's (NFV) 'clubhouse' - the building where they store and repair machines owned by the Association and its members. Last year they were in the process of moving to a new building and thus held the event in a nearby woodland lodge. 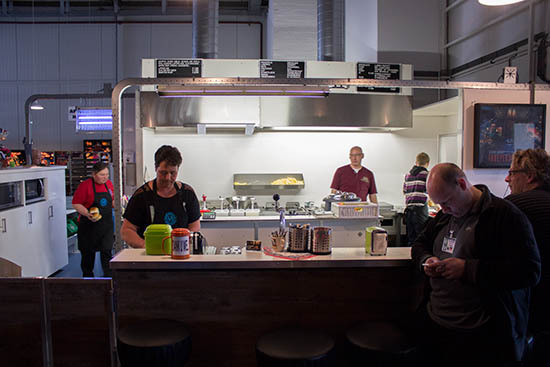 This year everything at their new home fully was set up, complete with catering facilities and workshop areas. 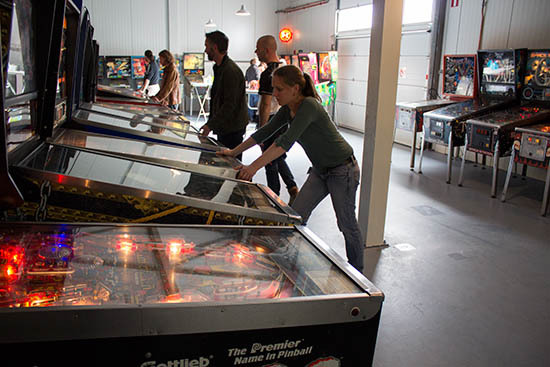 Inside, the great majority of the space is taken up with pinballs. 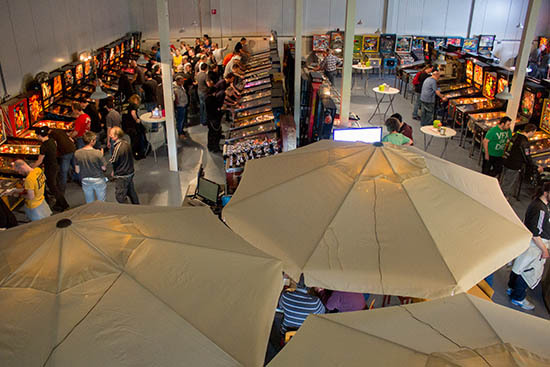 Around a third of the machines in the Clubhouse were used for the tournaments. The others were available for casual play or practice. 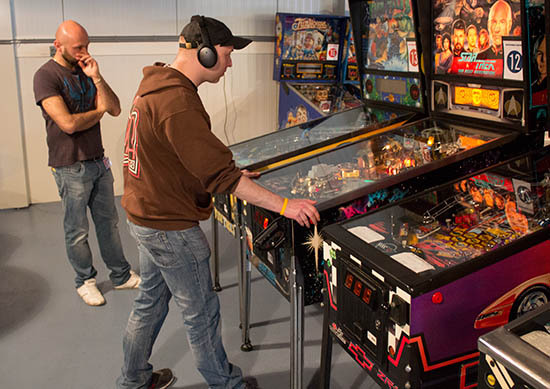 However, the Clubhouse is a place where games can be stored and worked upon, so quite a few of the machines in the practice area were either switched off awaiting repairs, or had significant issues affecting gameplay. For the DPM, a number of tables, chairs and parasols were brought in to provide a chill-out area where players could relax or eat. 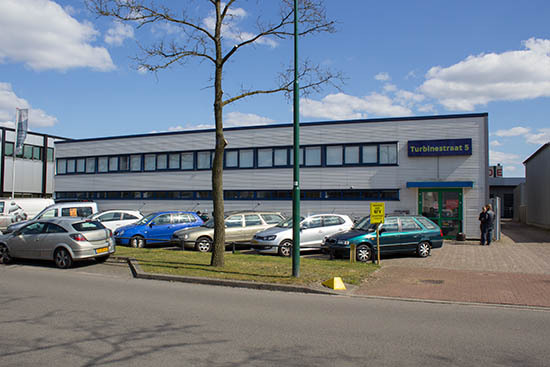 The building is on an industrial estate some distance from any shops or eateries, so most people chose to either bring their own food or partake of the sandwiches, burgers, fries, drinks and assorted snacks available from the food counter at pretty reasonable prices. But visitors weren't here for the catering. 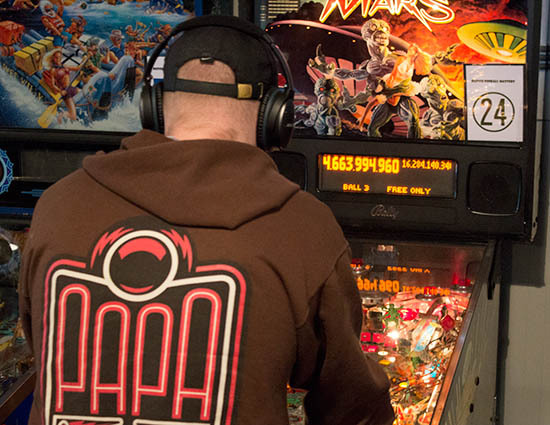 They were here to compete, and there were three competitive events taking place over the weekend - the DPM, the Classics and the Team Tournament. 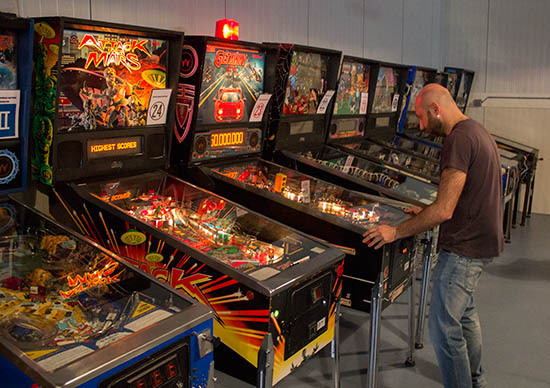 All the tournament machines were on the left side of the hall, arranged in two rows. 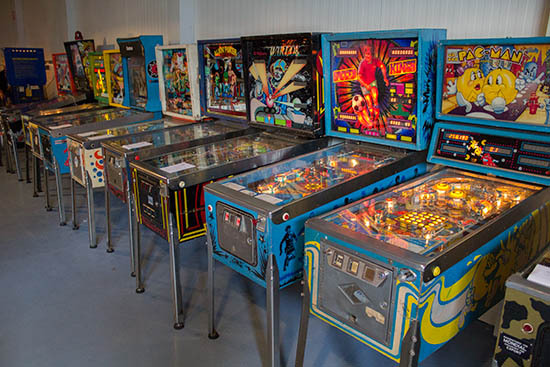 The DPM used 24 machines - the entire right-hand row and half the left-hand row in the picture above - while the Classic used an additional six machines at the start of the left-hand row. 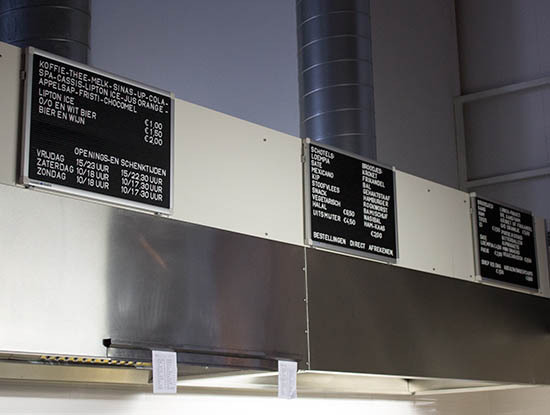 Several stand-by machines were also available in case of machine failure. 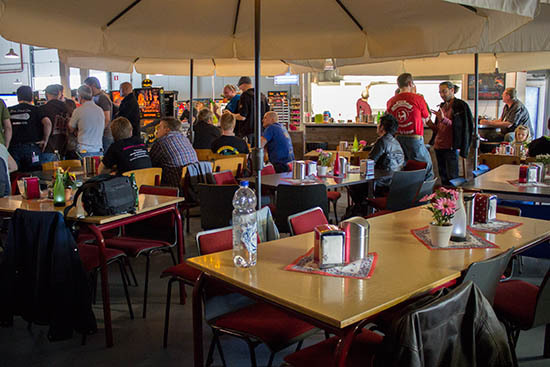 The Clubhouse opened at 9:30am on Saturday, and play in the first qualifying round of the DPM began an hour later once the first group of 52 players had signed in and received their badges and score cards. There were 104 players in total, and they were divided into 8 groups of 13 (groups A-H). The first four groups (A-D) played at 10:30am while groups E-H played at 2:30pm. Each competitor played a single 3-ball game against every other member of their group. If they won, they scored 1 point. Otherwise it was a big zero. The score cards showed who the opponent was in each round and who took the player one position. When all twelve rounds had been played, the four players with the most wins moved on to the play-offs on Sunday. In the case of a tie, the results of the matches between the tied players were taken into consideration to try to determine a winner; otherwise a tie-breaker game was played. 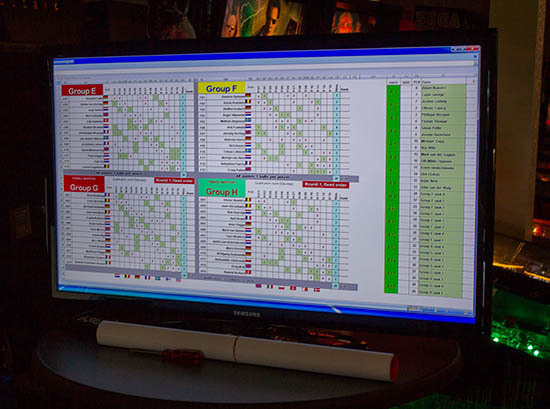 The scores were entered into a spreadsheet and the standings shown on a large TV. By the end of play at around 7:30pm, all 32 qualifiers for Sunday's play-offs had been decided. Meanwhile, qualifying in the Classics continued all day. 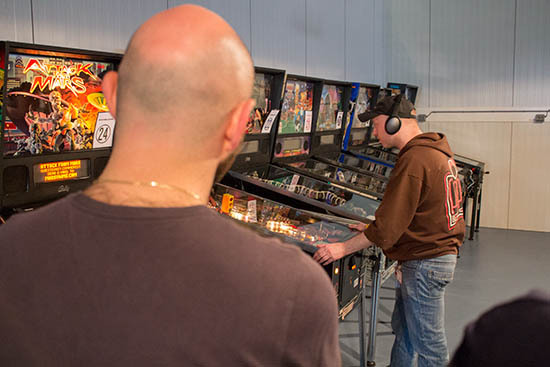 Entry to the Classics Tournament cost €3 ($3.37/£2.21) and consisted of a single game on any three of the six machines. You could purchase as many entries as you liked at €3 a time from the NVF stand. In all, more than 400 entries were recorded. 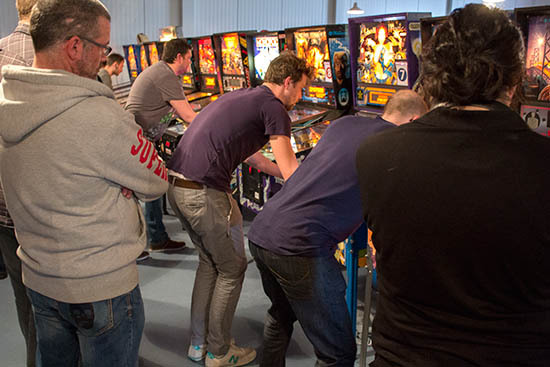 Each entry was ranked based on the total ranking of all three games, so you needed a run of three good scores on the same entry to be in with a chance of qualifying. In addition a single good score out of the three could reduce the ranking of a previous entry, so it was possible to void your entry if you failed to get three good scores. After day-long qualifying on Saturday from 11am to 10pm, there was an additional last-chance qualifying period on Sunday from 11am until 2pm. When qualifying closed, the top 16 were into the play-offs, with the top 4 getting two byes and the 5th-8th places getting one bye. 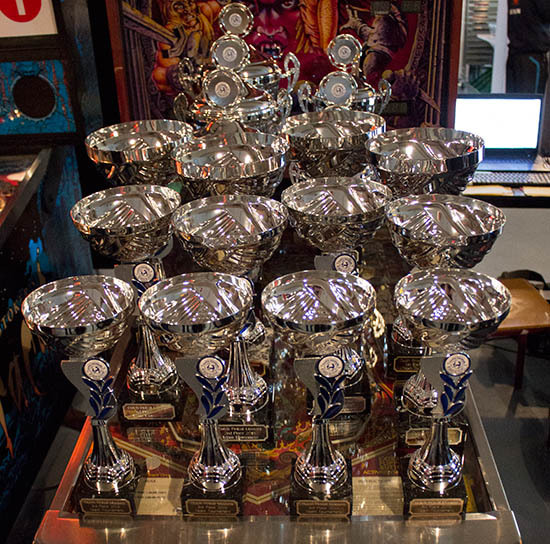 But the first tournament to be decided was Saturday evening's Team Tournament. 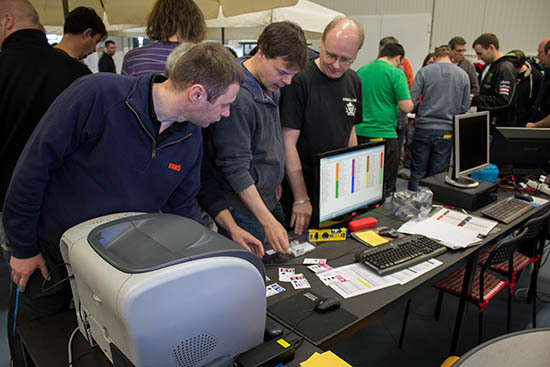 Twelve teams took part, and they were split into three groups of four based on the WPPR ranking of the team members. 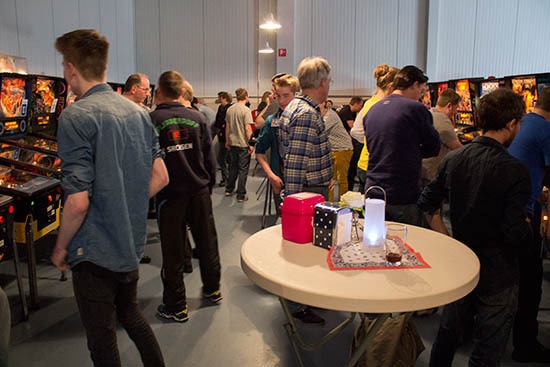 Every team played a match against each of the other three teams in their group, where a match consisted of two four-player games where two players from one team played against two from the opposing team. A 9-5-2-0 points system was used to score both games in a match, and the team with the most points earned 2 team points. If it was a tie, both teams received 1 team point each. When all matches had been played, the top scoring team in each group moved on to the semi-final rounds along with the highest-scoring second-placed team. In the semi-final, the best second-placed team played the top-scoring winning team in the same format as the matches above, while the other two winning teams played each other to decide who went into the final. 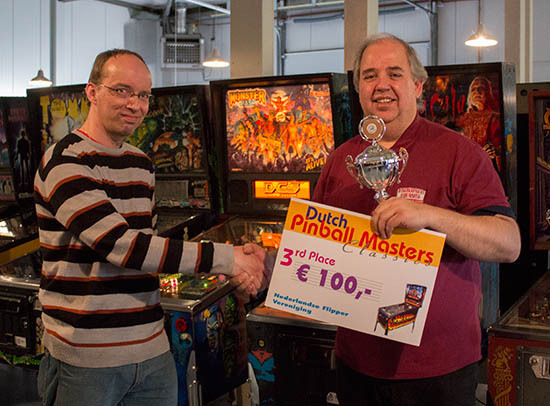 Two winning semi-finalist were Team DNA who beat Team Belgium by 21 points to 11, and Dutch Pinball Team who defeated Germany 2 by 20 points to 12. 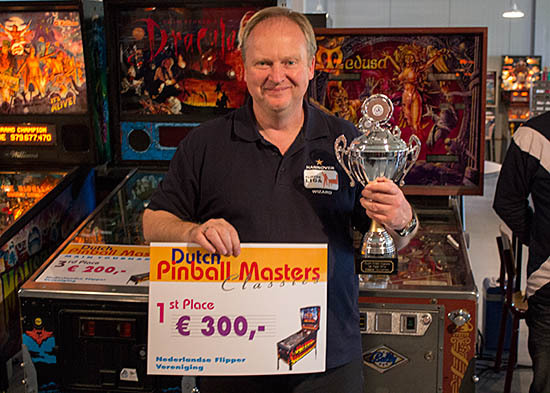 They played in a very close final which saw the Dutch Pinball Team repeat their victory from 2014 to take first place by 18 points to 14. 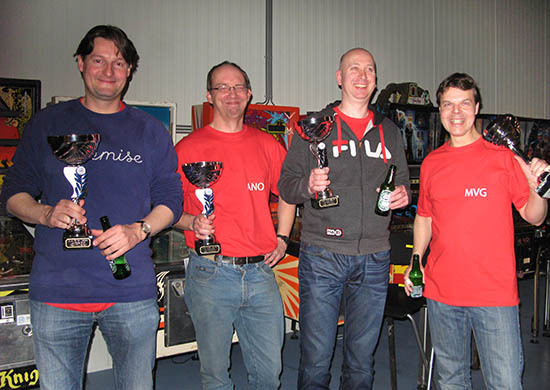 Team DNA were second, with Germany 2 winning the play-off for third place against Team Belgium by 25 to 7. 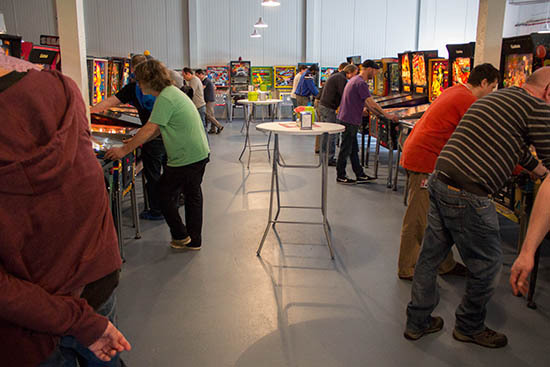 On Sunday morning the first round of play-offs in the DPM began, with the 32 qualifiers from the previous day paired up to play three-ball best-of-three games on machines drawn at random. 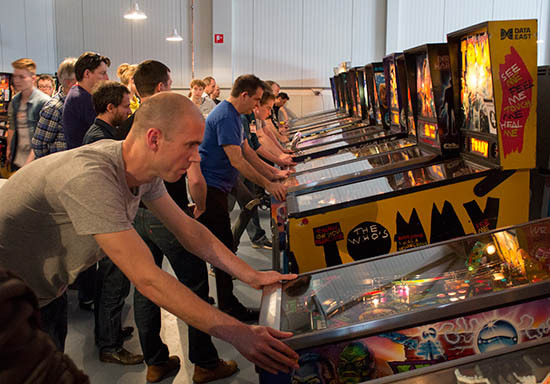 The sixteen winners moved on to the next round while the same number of losers dropped into the losers bracket to continue playing. The same format was used in the winners bracket all the way through until the winner made it into the final. That was Daniele Celestino Acciari who beat Roy Wils 2-1 in the last round of the winners bracket to knock him into the losers bracket. 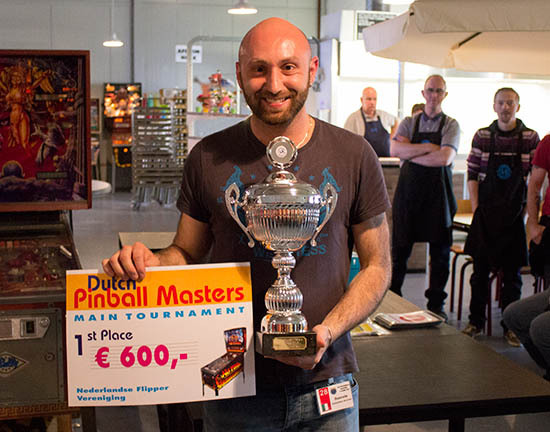 Roy then faced Lieven Engelbeen in the last match of the losers bracket, defeating him on The Addams Family to face Daniele again in the grand final. 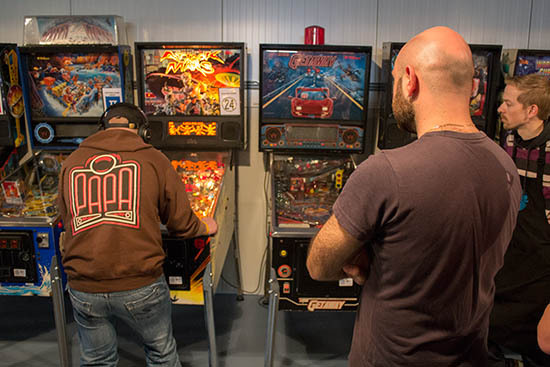 The first machine of the three-game final was chosen by Daniele and was High Speed 2 - The Getaway. It didn't start well for Roy, with just 8.6M after his first two balls. By contrast, Daniele scored 136M on his first ball and then really hit his stride on ball two, playing multiple Red Line Manias to eventually end on a huge score of 1.325B points. Faced with a near-impossible task, Roy decided to focus on game two and conceded the victory on Getaway to Daniele. Roy's choice of Star Trek: The Next Generation was game two, and after poor starts of under 20M from both players, he recovered to lead by 112M to 35M after ball two. Daniele pushed his score up to 211M on his third and final ball, but Roy got the main multiball going and soon passed him to level the match at 1-1. The decider would be Daniele's choice as the winner of the winners bracket, and he picked out Attack from Mars. It did seem like such a great choice after the first ball, with Roy leading by 2.15B to Daniele's 60M. Roy doubled his score on ball two to 4.59B, but Daniele got fully into the game and put up an impressive score of 16.28B on his second ball which included several super jackpots and a Total Annihilation mode worth more than 7B. It was a daunting task for Roy and now wasn't the time to get a rapid drain. Will Roy 'rule the universe' of face 'total annihilation'? But unfortunately that's just what he got, to end on 4.826B, leaving Daniele the winner with a ball to spare. 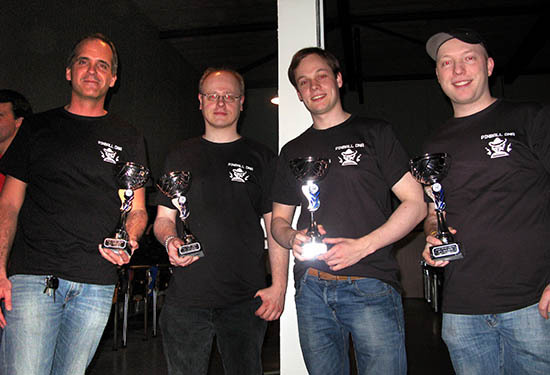 Roy was also in the final of the Classic Tournament where he faced Andreas Harre. 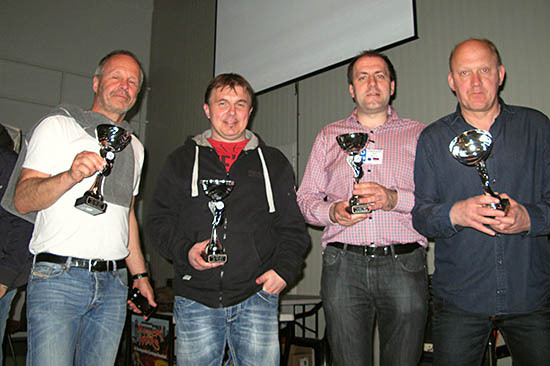 Once again though, Roy seemed destined to take second place just as he had in the DPM and the Team Tournament. 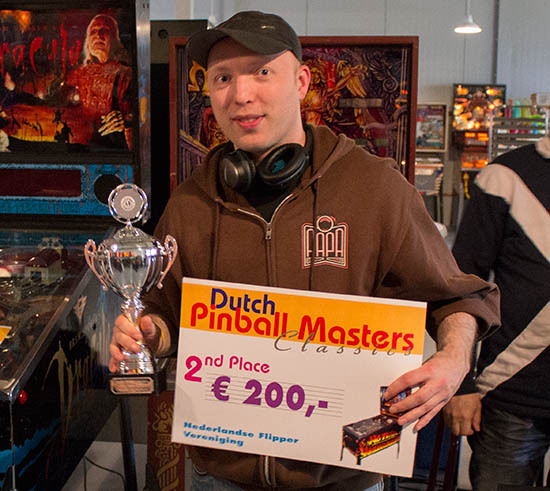 Andreas took a 2-0 victory to claim the Classics title. Andreas had beaten Martin Ayub 2-1 to reach the final, while Roy has the same score against Michael Trepp. Michael and Martin played a decider for third place which Martin won. 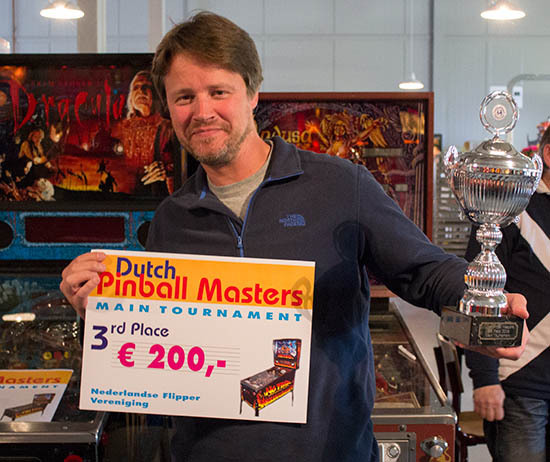 With all the trophies and cash prizes awarded, the Dutch Pinball Masters 2015 came to an end. 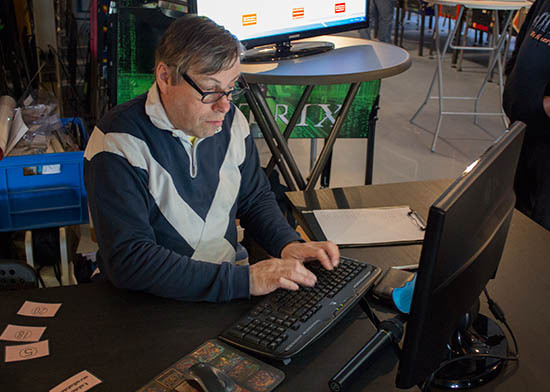 The DPM format proves every year to be a popular one, guaranteeing everyone a minimum of twelve games in the qualification round. 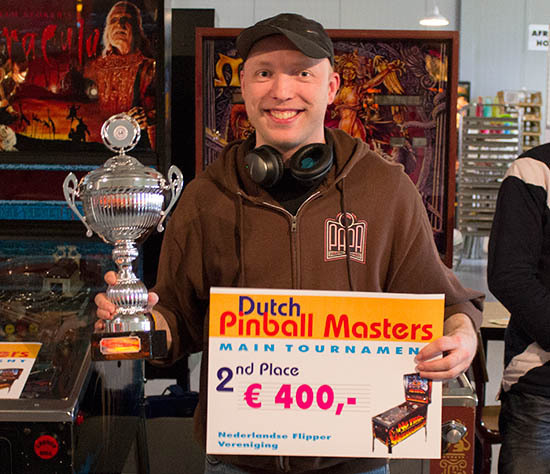 It is so popular that all the available places quickly sold out, leading organiser Albert Nomden to expand both the duration and the number of players for next year's DPM. The rest of the crew at the Clubhouse also made everyone feel welcome and provided a very professional service. 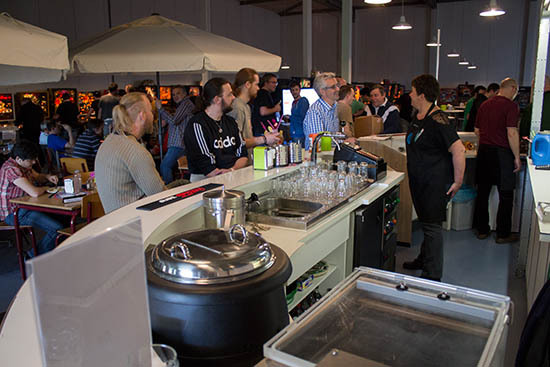 The Clubhouse is ideally-suited to holding events of this kind, with a ready-made supply of machines and service facilities. 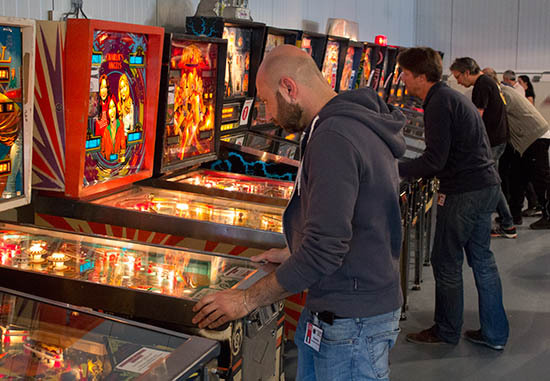 When a tournament machine had a problem, the repair team were quick to attend to it. 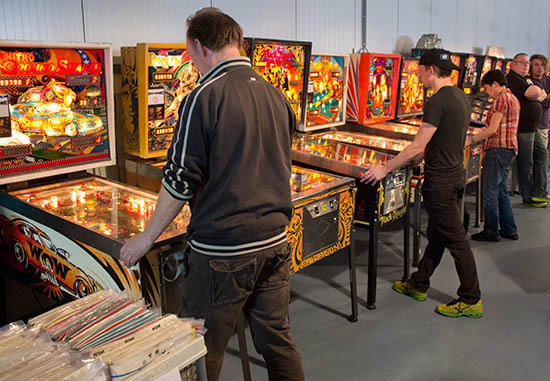 If it needed any soldering work, the machine was quickly wheeled out of the tournament area and into the repair room, while one of the standby machines was substituted. We'll certainly be back in 2016, as long as we can get one of those much sought-after places before they all sell out.